What do we do when a “good” teacher goes “bad”? 1Timothy 1:18-20 This charge I entrust to you, Timothy, my child, in accordance with the prophecies previously made about you, that by them you may wage the good warfare, (19) holding faith and a good conscience. By rejecting this, some have made shipwreck of their faith, (20) among whom are Hymenaeus and Alexander, whom I have handed over to Satan that they may learn not to blaspheme. What should be our response when people we have learned from, whose teaching seems to have been sound…go bad? What are we to think? Just who is such a person in reality? Many people have the mentality of ‘eat the meat and spit out the bones.” In some situations that may be wise. But in the case of a professing christian whose actions and teaching now show a pattern of falsehood and heresy do we continue to go to them for direction thinking that we can just ‘eat the meat and spit out bones’ of their works? Matthew 7:18-20 A healthy tree cannot bear bad fruit, nor can a diseased tree bear good fruit. 19 Every tree that does not bear good fruit is cut down and thrown into the fire. 20 Thus you will recognize them by their fruits. Simply put – Evil cannot produce good. If one sees a leader teaching heresy, it doesn’t matter what he has taught in the past – one needs to avoid that leader. If the leader has taught good in the past and it has benefitted people it was because of God’s grace, but to continue to follow that leader after you are made aware of their evil is dangerous and not scriptural. Remember, Satan himself is quite a good theologian and is very capable of teaching exactly what the Bible says…with a spin. When leaders that have a past history of ‘good’ teaching and ‘good’ works stand before God He’s not going to say, “Hey, you taught a lot of good stuff and helped a lot of people – I will keep that in mind” NO! God won’t acknowledge and take into consider the ‘good’ that false teachers did. He will simple say “I never knew you…” Never!! God won’t soften His stance against false teachers who have taught and done ‘good’ things in the past but now walk in falsehood and heresy. And neither should we. Thank you Pastor Crippen, the mind is definitely the enemies playground, it’s amazing how continual the onslaught is…’they’ never-ever stop, sometimes the sword and the armor get very heavy, but I try to just keep standing by God’s grace and His Spirit, and also knowing that Jesus suffered so as well. And due to financial and health reasons, I’m not able to be free of my abusers right now, I don’t know if I ever will be, but I do gray rock and try to have as minimal interaction as possible, which of course all makes me look like the anti-social one. I do have a part time job that I love though, it’s such a great blessing and my escape, and it’s my last refuge after having lost everything. I pray that this also won’t be taken away. Thank you again for all you do, I look forward to ‘going to church’ on Sundays again now, such a gift. 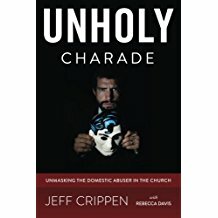 Pastor Crippen, much of the time I feel like the one that has been ‘handed over to Satan’, and that the false teachers and wolves in sheep’s clothing just keep being able to go on happily in their deception and abuse. I worry because many times I’ve been provoked to not my best self and especially to not my best Christian self, whether in reaction or for survival, and I feel that I’m the one who God is chastising. Not that I don’t need chastising or to learn proper ways of behaving, better obedience, or that I don’t have sin to deal with…but it’s that the abusers seem blessed. I know that’s twisted thinking but the more I become a shell of the person I thought God was pleased with, and more and more someone I don’t recognize at all and one whom I imagine God couldn’t possibly want anything to do with, I wonder how to move forward in my faith and where I truly stand. Sometimes I feel like a warrior for Christ and my faith, then others like the sludge of the earth. I pray for courage and right thinking, but the daily onslaught has worn me down. I’m not sure how God can use me this way or be pleased with who I’ve become, sometimes so weak and powerless to serve Him in ways that before I would have easily done. It’s very confusing and any insight would be greatly appreciated. I want to overcome. Jessica – I do understand. The battle is in our minds – that is where the enemy attacks us. Truth is the key, the sword of the Spirit, to stand against the enemy’s weapon which is lies. I don’t know all of the specific details of your situation, but I can make this suggestion. To any degree that you are able to go no contact with wicked people, go for it. Because if we have to keep being in contact with them it’s like getting in the car wreck over and over again and it is much, much harder to heal. For myself, I follow this policy. Anyone who makes me feel like all the old enemies I have been attacked by over the years, I cut off from myself. Anyone. I don’t care if it is some relative, some professing “christian” church member, no matter. They are gone. And I can tell you that life is much better afterwards. Now, of course I know that it isn’t always possible to go total no contact. The most common situation like that is when you share custody of children with an abuser. But to whatever degree you can minimize contact, the better. This is why I don’t get on people’s case and tell them they must be in a local church. Oh sure, there are some people who refuse to be in a church for sinful reasons, but you know how it is with most everyone here following this blog. They would love to have real fellowship with real Christians, but simply cannot find them. And it is no way better to “be in church” that not to be in church if that church is a den of sin. Hope that helps. You are not morally obligated to have contact with just anyone. Boy, do I hate those church signs that say “Everyone welcome.” Yuck!